The Charm Of Encanto! Jose Iniguez Graces The Moore Theater. On Saturday, November 26, Seattle’s historic Moore Theater saw hundreds of dedicated music lovers come in from the rain to enjoy a fantastic program that paired the ethereal beauty of opera with the charm of mariachi bolero; all for a good cause. The great Jose Iniguez, with the Ballard Civic Orchestra. Hailing from Mattawa, Washington, the accomplished, expressive tenor, and star of the evening, Jose Iniguez, treated a grateful audience to a night of his wonderful singing. Mr. Iniguez has a love for, and a deep knowledge of, classical opera and traditional Mexican mariachi. For his performance, he was joined by a variety of music ensembles, including a chamber quartet, a civic orchestra, and a full-fledged Mariachi — the awe-inspiring Mariachi Huenachi — Wenatchee High School’s gift to the world of music. Over the course of the evening, it was rewarding to hear the talented Mr. Iniguez featured in such varied settings. Before the performance began, a social hour and silent auction was held. As people visited with each other, enjoying food and beverages, the excitement was already building in the Moore. People could feel the magic in the air. And, eventually, everyone took their seats, to enjoy the evening’s two acts which the gifted group of performers generously presented. Co-emcee’s Niveen Heaton and Justice Steve Gonzalez. The production was honored to have as co-emcee’s fashion designer Niveen Heaton, whose company creates Americana-Latina-inspired swimwear, and Justice Steve Gonzalez, who was appointed to the Washington State Supreme Court in 2012. 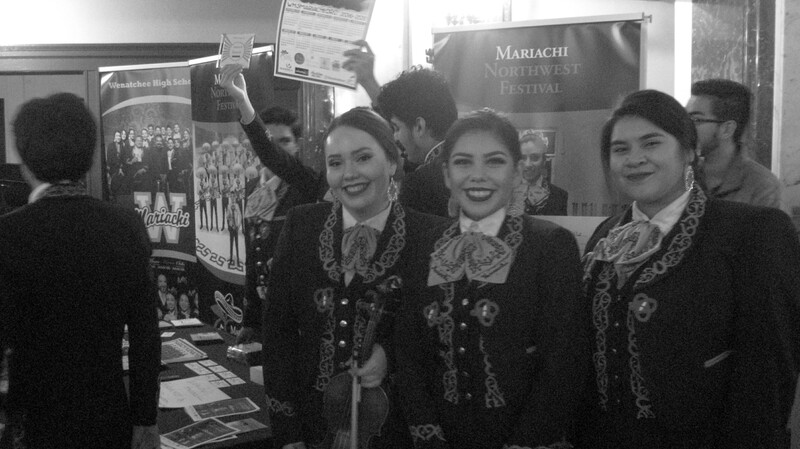 Wenatchee’s Mariachi Huenachi, displaying their excellence. 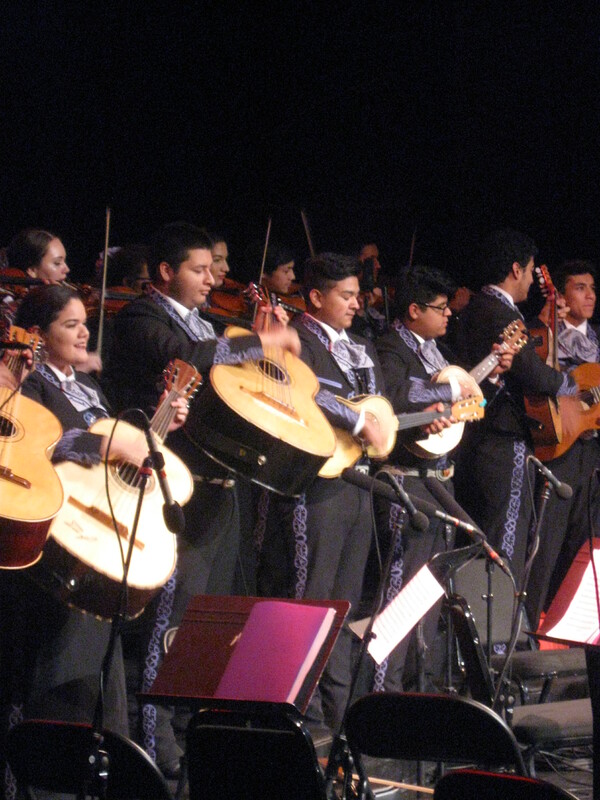 The program began in fine fashion with a five-song performance from Mariachi Huenachi. These seventeen and eighteen year old singers and musicians are accomplished far beyond their youth. They performed “La Faceta”, ”Tarde”, ”La Differencia”, the much-loved ”Cucurrucucu Paloma” and ”Aires del Mayab”. 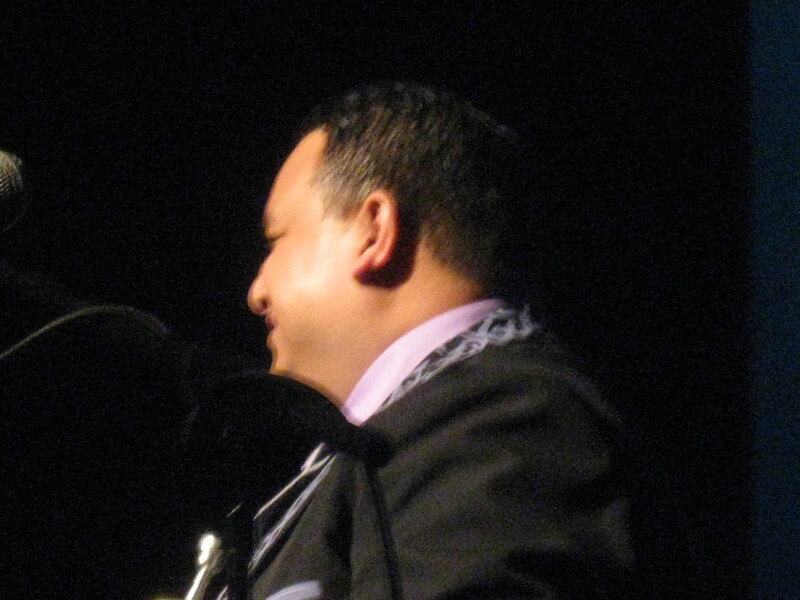 Mariachi Huenachi director, Ramon Rivera. Mariachi Huenachi members receive much more than a music education from their Golden Apple Award-winning director, Ramon Rivera. Mr. Rivera guides his students as they find the keys to success in life outside the world of mariachi music. Students from his program typically seek and receive scholarships, advancing to major colleges and universities, where they eventually become the next generation of American professionals. A short video was shown about the evening’s fund-raising activities. Not coincidentally, the evening was dedicated to fund-raising for the Iniguez Family endowments at Eastern Washington University, Central Washington University and the Camino Foundation. Scholarships are bestowed to Latina/o students who are active in the Latina/o community with preference given to first generation students. — A silent auction was part of the fund-raising activity which took place throughout the evening. So while the evening was dedicated to the charm of opera and bolero music, it was also dedicated to the ongoing work of pairing talented young people with institutions of higher learning, making it an even more rewarding, inspiring night of music and holiday festivities. Bandoneón player Mirta Wimerszberg performed with the Ballard Civic Orchestra. Throughout the evening, the crowd was treated to the music of talented soloists, including bandoneón player Mirta Wimerszberg, and flutist Teresa Caballero. Pianist Jeremy A. Neufeld, who played in the ensembles that backed Jose Iniguez, also contributed a solo piece, masterfully performing Liszt’s dramatic “La Campanella”. Teresa Caballero played a very moody, atmospheric piece. Jeremy A. Neufeld, pianist, Jose Iniguez, Ballard Civic Orchestra, with director Paula Nava Madrigal. As mentioned, Mr. Iniguez performed with several ensembles, including his associates, chamber musicians Neufeld on piano, and violinist Eddie Nicholson. 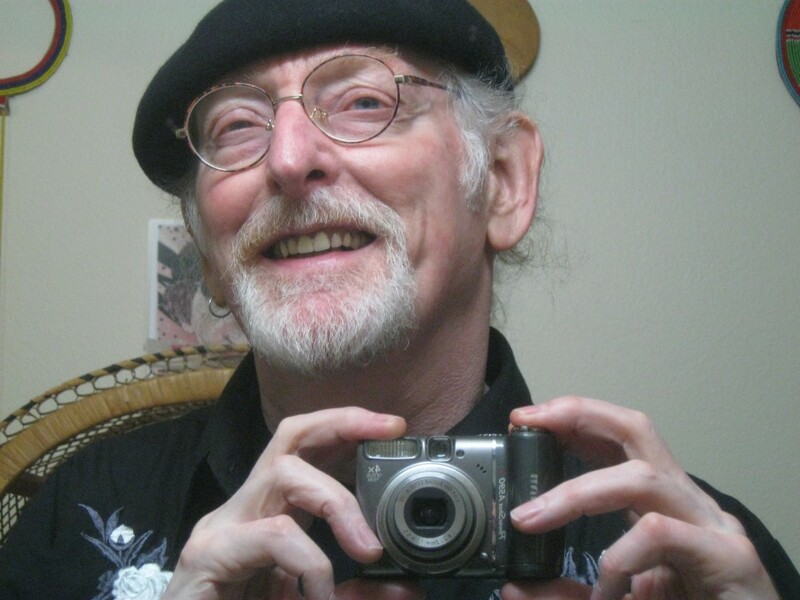 He sang with Mariachi Huenachi, and with Seattle’s own Ballard Civic Orchestra, whose conductor, Paula Nava Madrigal, holds a BA in music from the University of Guadalajara. The talented violinist, Teo Benson, spouse of Ms. Madrigal, also performed with the Ballard Civic Orchestra. All in all, there were so many fine players in attendance that one had difficulty keeping track of them. Jose Iniguez with Rocio Jimenez. Later Ms. Jimenez sang a beautiful, solo “Ave Maria”. Some of the selections Mr. Iniguez performed were “Che Gelida Mania” from La Boheme, “Music of the Night” from Phantom of the Opera, “Payaso” (The Clown), and “El Briindis” which he performed in duet with soprano Rocio Jimenez. Jose Iniguez and Chuy Aguilar. Toward the conclusion of the evening, Mr. Iniguez sang another duet, this time with a young man named Chuy Aguilar, on the modern, striking “Miss Sarajavo”, a piece co-written by U2 and Brian Eno. It should be noted that Mr. Aguilar not only sings; he is also a talented guitarist. It’s not often that a mariachi and civic orchestra are heard together. To end the program, all of the groups came together to form one large orchestra, to play out the night. It was marvelous to hear Mariachi Huenachi playing hand in glove with the Ballard Civic Orchestra, along with Jeremy Neufeld on piano, and of course, with our leading light, Jose Iniguez sharing his amazing vocals. The song the expanded group performed, legendary composer Pedro Infante’s “Cien Años”, couldn’t have sounded better. — The evening ended on such a high note; this contributed to the appreciative audience’s reluctance to leave the Moore. Folks gathered around the performers in the lobby, taking photos, visiting, and generally celebrating a wonderful night of music, all the while, fund-raising for our next generation of successful professionals. The cultural richness of our region was spotlighted once again at the Moore, thanks to the efforts of many people in front of, and behind the scenes – people who know what fine gifts come from labors of love. My thanks to Seattle’s Barbara Rodriquez for enabling my participating in this wonderful event. Bonus Photos: Here are a few more photos from the event. Interior of the beautiful, old Moore Theater. The Moore stage, curtain down. Mariachi Huenachi members in B&W.